Jordan Goodman is considered America’s Money Answers Man because he is the man to go to for answers to personal finance questions. He has appeared on several TV and radio shows. He believes that there is a tremendous amount of financial illiteracy in the country and wants to help people learn. He has written 14 books including the popular Fast Profit in Hard Times and The Dictionary of Finance and Investment Terms. 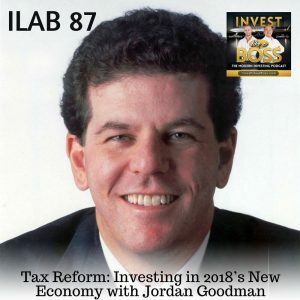 On this episode, Jordan explains the impact of the 2018 tax reform both in corporate and individual level. He also explains its impact on the stock market and other investment ventures. He gives tips and strategies on what, where, and how to invest in this new economy. He also shares his personal favorites in terms of asset classes and trends that will help you decide on your next investment plans. Listen to ILAB 87 on iTunes here or subscribe on your favorite podcast app. 1. Secured Real Estate Funds. These Regulation A+ funds, (often referred to as crowdsourcing funds) were authorized by the Jobs Act of 2012 and they allow the average investor access to investments that used to be available just to big institutions. My favorite example is the Secured Real Estate Income Strategies LLC fund atwww.securedrealestatefunds.com. It lends money short term (like one year) to commercial real estate projects all over the country and pay a preferred 8% annual yield in monthly installments. When the projects that they fund are sold, fund shareholders get an additional profit sharing distribution which could add another 1% to the return. Net asset value stays at $10 so it is not impacted by the volatility of the stock or bond markets. Minimum hold time is one year and minimum investment is $5,000. They use the strategy of Collaborative Lending and Forced Appreciation which I can describe more in the interview. 2. Permian Basin Oil and Gas Funds. The Permian Basin in Odessa-Midland Texas is the most productive oilfield in America, and funds that own oil wells there can provide great returns. My favorite is run by Resolute Capital Partners at the website www.resolutecapitalpartners.com. You can invest either on the debt side where you earn 8% for one year and 9% if you commit for two years in quarterly payments. Or you can invest on the equity side where your returns can be 40% or higher, depending on the price of oil. Their cost of bringing out a barrel of oil is $17 a barrel so at current process of about $60 a barrel, profits will be enormous. There are also many tax benefits involved which I can explain when we speak. 3. High yields and Growth from non–Manhattan real estate. While most real estate people concentrate on investing in Manhattan, there are even better opportunities in Brooklyn and Queens where there is not as much competition for good deals. Then Goodman Real Estate Fund (no relation to me by the way) buys and fixes up apartments and homes and offices in the outer boroughs of New York. It pays a preferred annual yield of 10% and then pays additional distributions when it sells properties at a profit. That has amounted to a total return of 17% over several years. People can find out more at www.goodmancapitallc.com.